I started out the year motivated to deep clean/declutter/organize and (in some cases) redecorate every room/space in our home. I made a list of each area (because I like to check things off) and came up with 26 rooms/spaces/areas to work on. My goal was to work through them all by June 30. 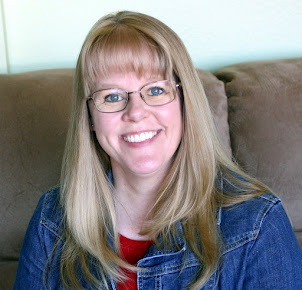 I got off to a great start in the Laundry Room and Front Hallway and shared those completed areas with y'all here on my blog. I haven't shared anything about this goal since the beginning of February, however we have been busy and completed several projects over the past few months. Here's a look at two of the projects we've completed. 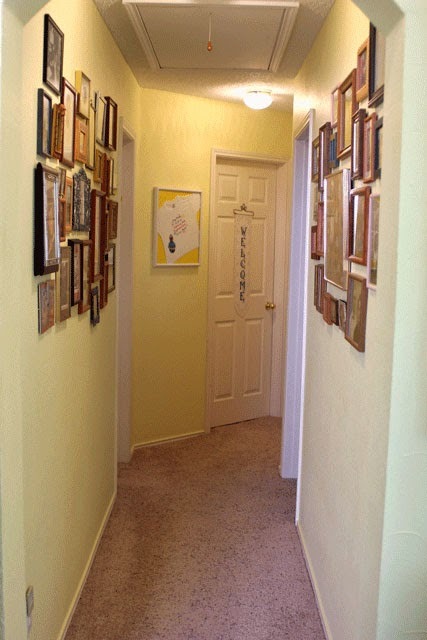 The first project involved our front hallway. 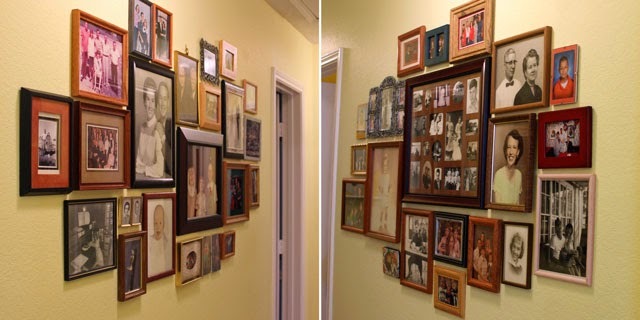 As you can see, we use this area to display framed family photos. We first hung photos here shortly after we moved into this house over seven years ago. 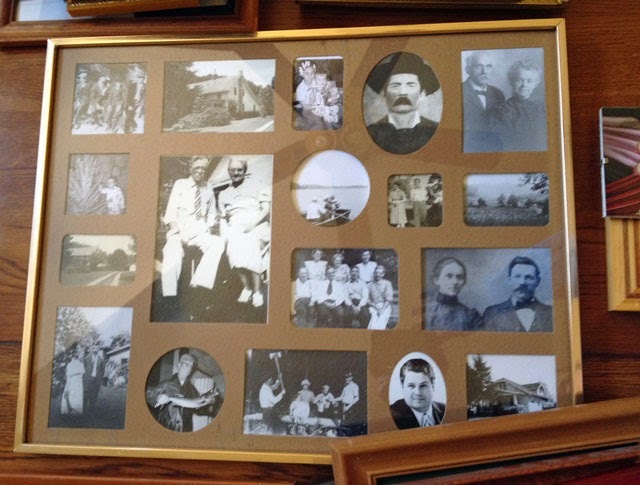 I removed all the photos, puttied all the nail holes, touched up the paint, and purchased a few new frames. Robbie wanted to reuse the mat from the old family collage, so I used a dark brown distress ink to even out the color and cover the stains. He then framed all the new and updated photos for me, and we hung them all back up. It totally makes me smile to walk into the front hallway and see all these photos rearranged and updated. The second project involved lighting. In our large front room, there were four different light fixtures - a ceiling fan & light that we added after we moved in (but is no longer manufactured so we couldn't match it! ), a really cheap gold chandelier that I added lampshades to years ago, a pendant light (that hung down in front of the quilt I have on display), and a set of track lighting. It's always bothered me that these fixtures were so different in the same room, so Robbie replaced them all! 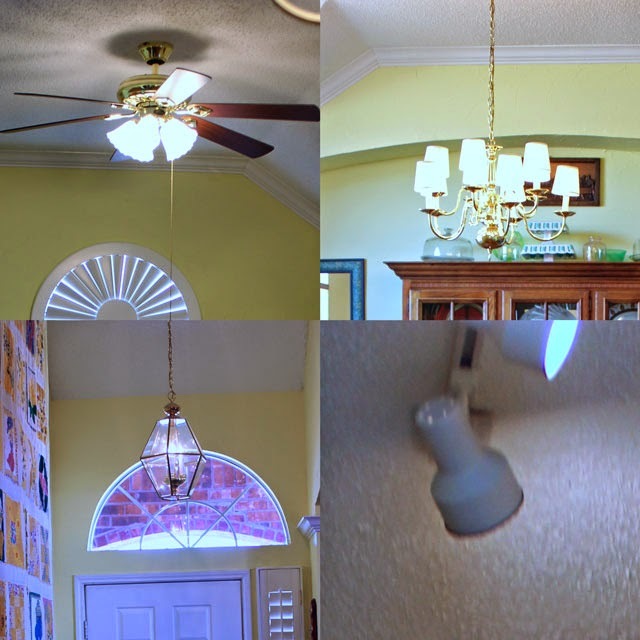 He put matching ceiling fans & light fixtures in the main part of the room (replacing the ceiling fan & chandelier) and matching ceiling-hugging light fixtures in the foyer part of the room (replacing the pendant & track lighting). Robbie also replaced the two light fixtures in the front hallway with new ones. 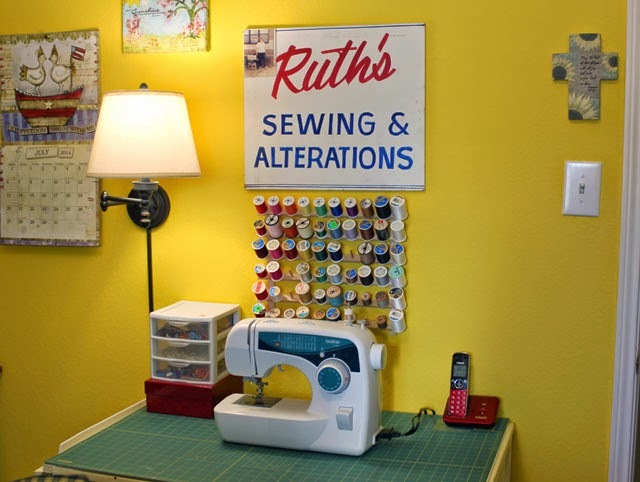 Then he installed a new wall mounted lamp by my sewing table. [And because the ceiling fan from the front room had five lights (instead of four like all the others), Robbie put that one up in my craft room. And because the ceiling fan from the craft room matched the guest bed frame, Robbie put that one up in the guest room.] Isn't he handy!! While I haven't yet deep cleaned/decluttered/organized the entire house, I have to admit that I'm very pleased with the progress we've made. 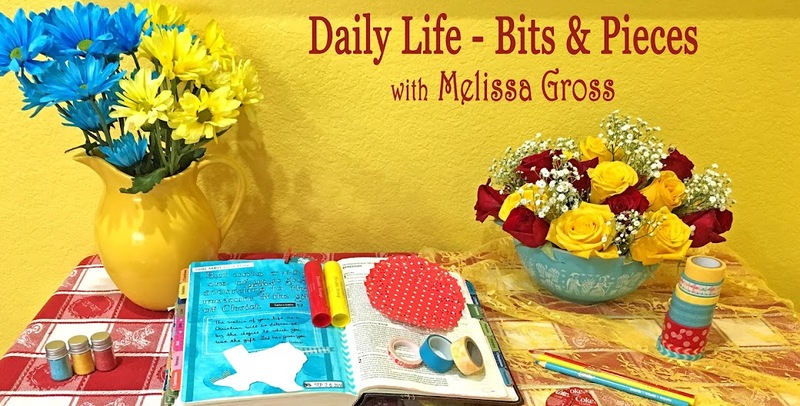 I'll share a few more completed projects in an upcoming post. 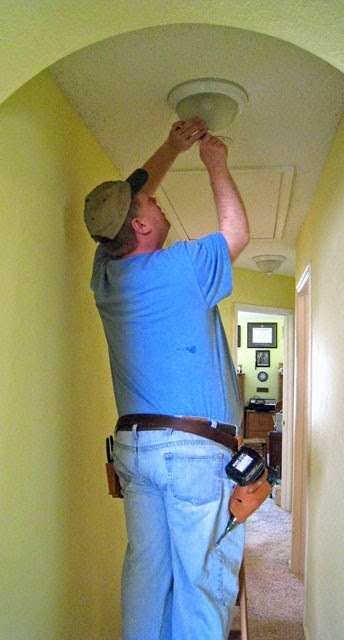 Have you completed any home improvement projects this year? 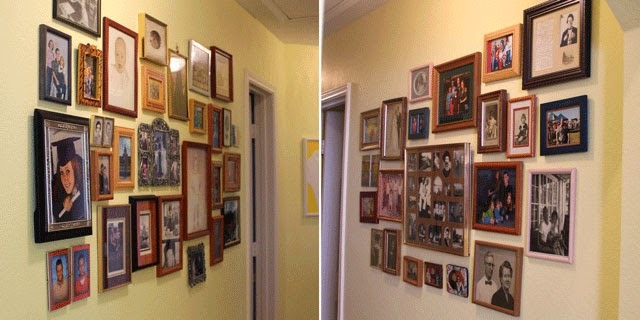 The re-do of the hallway turned out great - definitely a more pleasing arrangement of all those photos! 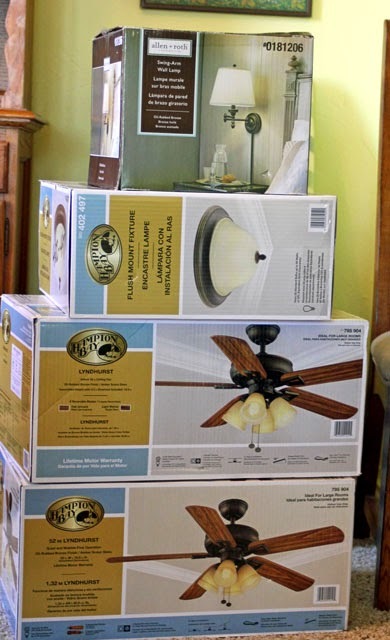 And isn't it amazing how changing out a light fixture can change the feel of a room? Kudos to Robbie! I haven't gotten very far with decluttering this year. In fact, I feel like I got stopped dead with the girls home for the Summer. Very slowly working on the guest room. Twin cot has been replaced with a queen bed and the Walmart particle board night stand was replaced with an antique music cabinet. The antique dresser is currently in the process of being refinished. Those displays of pictures look great now. Arranging photos for a large display is quite a task; they look great! I've done a good job with decluttering on the first two floors, but we've gotten stalled in the basement! Well done it's looking great. I like the photo display and well done to Robbie for changing all the lights. That's on Wookie's to do list as well. Well aren't you two the busy ones. Updating the photos in frames around here is on my to-do list, too. I bet it is very satisfying.